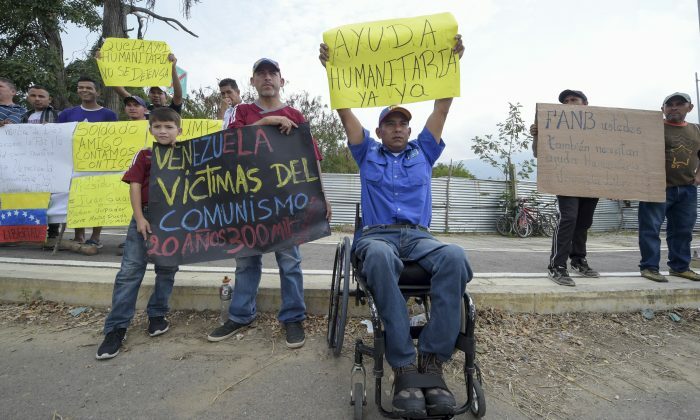 CUCUTA, Colombia—Members of the Venezuelan opposition working to send humanitarian aid into the country say the answer to breaking the blockade by the Maduro regime will involve the mass mobilization of the Venezuelan people. Efforts by a coalition of the opposition, the United States, and Colombia to send food, medicine, and hygiene supplies to alleviate the suffering caused by the country’s spiraling economic and political crisis were complicated last week when the National Guard loyal to Venezuelan leader Nicolas Maduro blocked a bridge connecting northeastern Colombia with western Venezuela with two overturned shipping crates and an oil tanker. U.S. and Colombian government officials have said little about how the aid could be delivered into Venezuela, but interviews with members of the Venezuelan opposition in recent days confirm that plans are to break through the border through a mass public mobilization. Lester Toledo, an envoy of Juan Guaidó—recognized by Washington and others as Venezuela’s interim president—suggested the opposition would call on the public to force it through. Opposition figures, in conversations with The Epoch Times, have also confirmed that a large-scale mobilization is the preferred plan to get supplies past the National Guard. 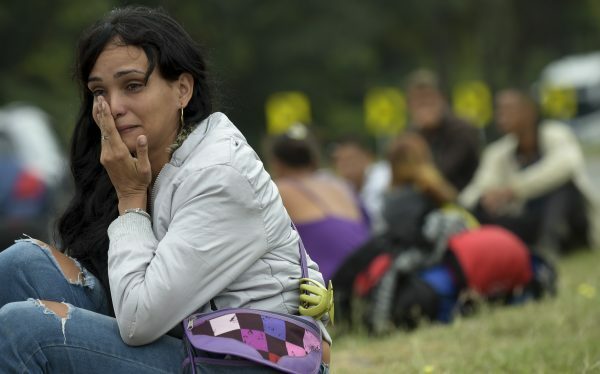 Omar Lares, an ex-mayor of a town in the Venezuelan state of Merída currently exiled in the humid border town of Cúcuta, Colombia, echoed Arellano’s sentiment, saying that plans were afoot for “a chain of people” to secure the aid’s safe passage across the border. Such a plan could put its participants at risk should the military rank and file stay loyal to Maduro and obey orders to stop the efforts, but the opposition says the only danger is that Maduro continues to remain in power. “The greatest risk for my people is that Maduro remains inside the presidential palace,” said Arellano, at a local meeting point for opposition members coordinating the relief effort. Arellano also confirmed that two other aid shipments, sent from Brazil and a Caribbean island, should arrive in coming days, and that Guiadó will provide further details on the shipments’ routes to Venezuela on Feb. 12. Mass protests across Venezuela are also set to coincide with the announcement on the same day, marked as the National Day of Youth, and could potentially spread to the border. 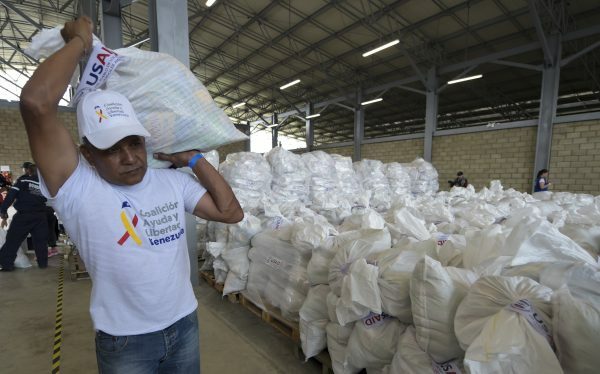 The first shipment, one of three initiatives funded by $20 million pledged by the United States for Venezuela, sits in a warehouse at the barricaded Tienditas bridge in Colombia. Maduro says the aid initiative is an international ruse to overthrow him and that Venezuelans won’t allow it as they aren’t “beggars.” Guaidó, who is now recognized by more than 40 countries as Venezuela’s legitimate interim leader, has called for the aid to end the suffering of 300,000 starving people. Some 3 million Venezuelans have left the country since the crisis began four years ago, fleeing widespread food and medicine shortages and rampant hyperinflation of more than 1 million percent, which makes even the most basic goods unaffordable. Guiadó invoked the constitution on Jan. 23 to assume the presidency, on the basis that Maduro had rigged elections. While Guaidó has gained international recognition and his popular support grows, Maduro remains in power with the backing of the military. Since the dramatic barricading of the bridge, there has been no official announcement as to how the opposition plans to break through the military, which is under orders to prevent delivery of the aid. Should the opposition succeed in convincing the military to disobey orders, the aid could be delivered, and would serve to weaken—and potentially even break—Maduro’s regime by rupturing the military’s loyalty to its leader. U.S. Ambassador to Colombia Kevin Whitaker, speaking in front of a large warehouse full of bags of lentils, rice, and pasta near the Tienditas bridge on Feb. 8, encouraged the Venezuelan military to let the aid flow or risk standing on the wrong side of history. “The decision you make will be remembered by your mothers, your sisters, and your daughters,” Whitaker said in front of international press. Should the military hold firm, the white sacks that include enough food kits for 5,000 Venezuelans and high-protein nutritional supplements for 6,700 malnourished children, could sit in warehouses indefinitely.